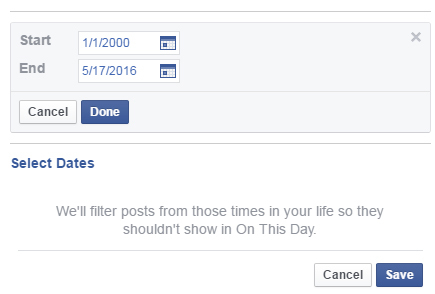 I’ve been really trying to filter out all the stuff that shows up on my Facebook news feed. Facebook does have some positive benefits, but wow – there is so much stuff on there that I don’t care about. Not that it’s necessarily bad stuff (although some of it is really terrible) – it’s just content that I decide I don’t want to waste my time or thought processes on. For me, one of those things is the constant reminders of my “memories” – the stuff that was on Facebook a year ago or 5 years ago, or longer. Fortunately, there’s a way to stop it from displaying for a while. 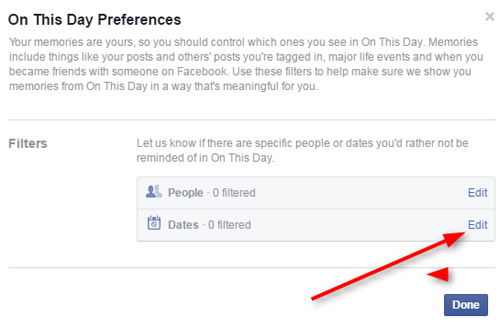 This tells Facebook that you don’t want to see any “nostalgia” or “memories” that happened to take place between those two dates. 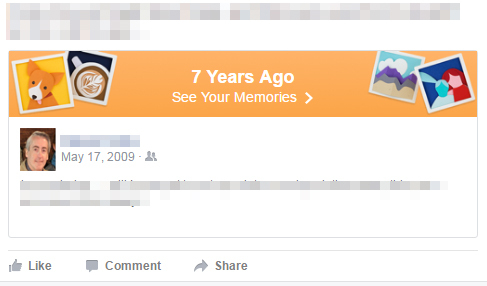 It would be must better if Facebook just offered a switch to disable the nostalgia stuff from appearing, regardless of what the date was. By entering the date range as we did in the example above, it just means that a year from day you might start seeing those silly things again. Maybe by that time there will be a way to just turn it off completely.